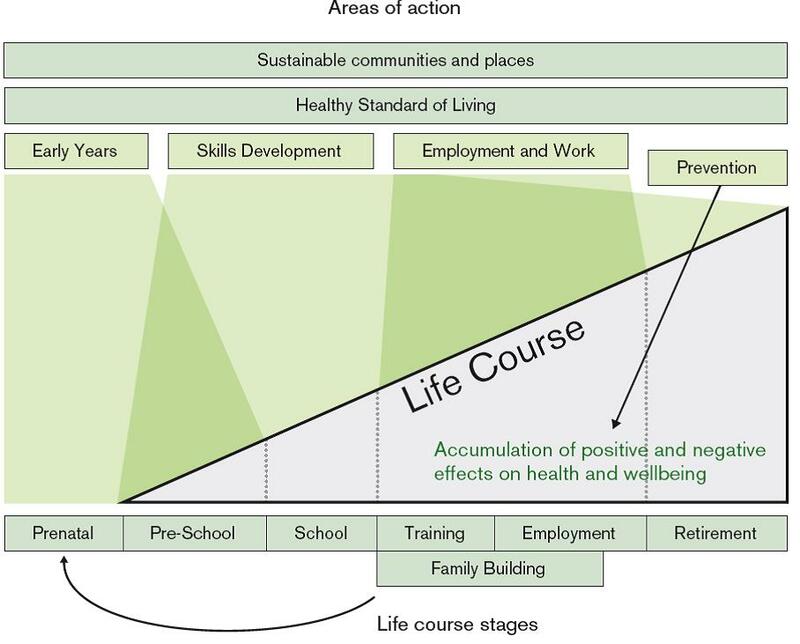 The Health and Wellbeing Board looked at the various stages from pre-birth to older age to understand what health issues may arise over the course of people’s lives (see Figure 2). The ‘life course’ approach ensures the people of Devon have the best start in life, the right opportunities as they develop and start working, and enjoy healthy older age with the necessary care and support that may be needed. 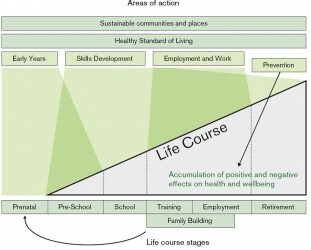 Figure 2: Action Across the Life Course. The Marmot Review: Fair Society, Healthy Lives 2010. Action will be delivered through a significant shift in resource, focus and effort to prevention and early intervention whilst developing social capital, including neighbourliness, family support and personal responsibility. Reduced differences in life expectancy and healthy life expectancy between communities (including differences between and within local authorities). Whilst the Health and Social Care Act (2012) places a duty on upper tier local authorities to work to improve the health of their populations the Devon Health and Wellbeing Board is best placed to work through a genuinely collaborative approach with the Borough, District and City authorities to oversee the impact of local actions on the range of health and wellbeing outcomes and progress in relation to reducing inequalities. At the same time the Board will monitor the extent to which the two Clinical Commissioning Groups, the NHS Commissioning Board, and local authorities’ plans for commissioning services are informed by the Devon JSNA and JHWS. The Devon Shadow Health and Wellbeing Board has already stated its ‘commitment to promoting health equality’. In recognition of its responsibilities under the Public Sector Equality Duty the Board has agreed that dedicated Joint Strategic Needs Assessment topic pages and an associated outcomes framework specifically for the ‘Protected Characteristics’ groups are produced. Within this Joint Health and Wellbeing Strategy the likely impact on health inequalities for each individual priority is described.